It was just only a day when our hearts were filled with pride and country was still celebrating India’s 72nd Independence Day, and, we heard the most saddening news. Former Prime Minister of India Atal Bihari Vajpayee’s demise. Atalji breathed his last yesterday at 5.05pm on August 16 and passed away at the age of 93. Battling with age related problems from last two months, Atal Bihari Vajpayee was admitted at Medical Sciences (AIIMS) in Delhi since June 11 this year. Atal Bihari Vajpayeeji who is also known as India’s tallest leader was a great politician, phenomenal poet, effective orator and above all, he was a great human being with greatest virtue and visions for our country. The country has lost the shining gem of an era and every single person is grieving the death of BJP(Bharatiya Janata Party) leader Sri Atal Bihari Vajpayee. 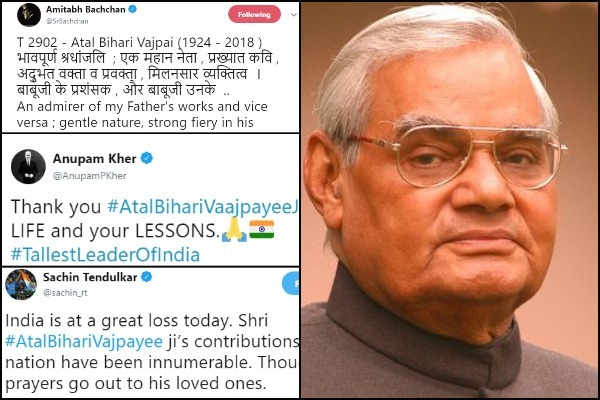 Over the years, former late PM Atal Bihari Vajpayee was loved and admired by Bollywood celebrities too for his great sense of humor and motivational speech. My heartfelt condolences to the country, as we mourn the demise of our visionary leader, #AtalBihariVajpayee ji. May his soul rest in peace! The end of a golden era comes with the deeply saddening news of the demise of Shri #AtalBihariVajpayee ji. Mourning with nation. What a man, what a mind. Over come with such deep sadness.. Various leaders across the political spectrum and commoner’s heart too is grieving over the demise of our beloved Prime Minister Atal Bihari Vajpayee. Atlji’s last rites will be conducted near Smriti Sthal on the banks of Yamuna. His funeral procession will begin at 1.30 pm in the afternoon. May his soul rest in peace. Om Shanti! Previous : Amber Heard Hits Back At Johnny Depp’s Claim That She Pooped In Their Marital Bed!